The maturity of cloud platforms inspires new confidence in moving mission critical systems to the cloud to gain agility, scale, and cost benefits. How can your company achieve these benefits? What steps are necessary to begin your contact centre’s inevitable move to the cloud? Choosing the right contact centre partner will ensure your cloud journey success. Do you know how to find the right contact centre partner to help move to the cloud? 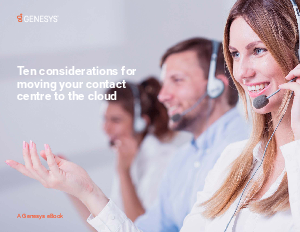 This eBook offers ten key considerations for selecting a partner and moving to a cloud-based contact centre. Having a good sense for your business requirements, your prospective partner’s capabilities, and the cultural fit will pay off in helping you realize your business goals in the long run.